Hh’s founders stumbled on the former Haas Type Foundry on a trip to Switzerland in 2016. CK Anderson, photographer; Linda Anderson, hand model. This is where history was made. Behold the birthplace of Helvetica – the very place where the famous linotype matrices were first produced. It’s in Münchenstein, Switzerland, which is just outside of Basel. The book you see in the foreground of the above photo (Helvetica Forever, Lars Müller Publishers) shows two small photographs of the interior and exterior of the Haas Type Foundry’s new production plant, which they moved into in 1921. Haas began operations in 1580 and continued all the way up to 1989. That 409-year run made it the oldest type foundry in the world. 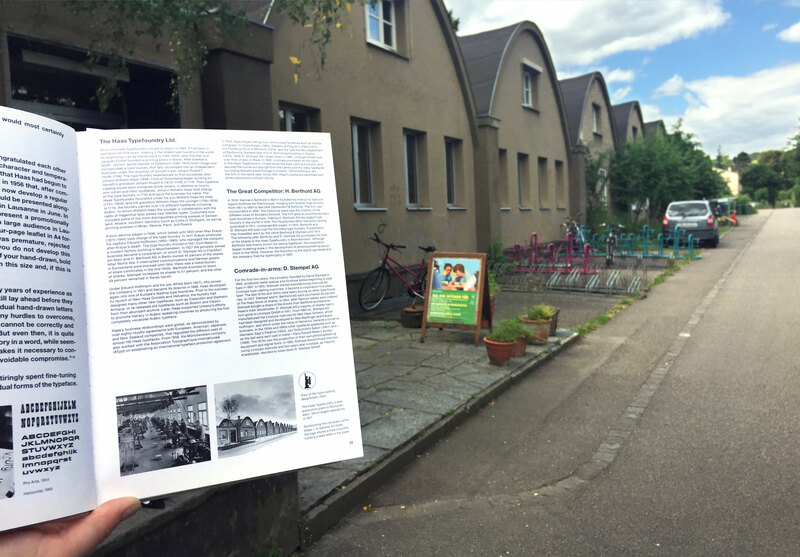 Today, the facility is home to the Rudolf Steiner Schule Münchenstein, appropriately located at Gutenbergstrasse 1.